In July 1936, under the authority granted by the 1911 Weeks Act, President Franklin D. Roosevelt designated as a national forest the 77,000 acres the federal government already owned in North Carolina's Craven, Carteret, and Jones Counties. The forest was named Croatan after the Indian tribe living in the region at the time of the so-called Lost Colony (1587). The federal government had originally acquired this land in 1933, 1934, and 1935 to use for reforestation experiments. The area, about one-half of which was pocosin, or raised bog, and the other half pine forest, had by then lost most of its timber either to forest fires or to lumbermen with little concern for conservation. The only profitable industry associated with that rugged terrain in recent years had been the manufacture of bootleg whiskey, large quantities of which were sold around Havelock and Stella during Prohibition. Before Europeans arrived in North Carolina, Native American tribes had used this land to hunt and fish. They, like the Europeans and enslaved Africans who came later, found much of the area ill-suited for agriculture. During the colonial and early national periods, enterprising farmers built canals to drain Catfish Lake, Long Lake, and Lake Ellis in hopes of turning these spring-fed lakes into rice and cranberry plantations. Rice did better than cranberries, but neither prospered as well as the native vegetation (everything from 1,000-year-old cypress trees to five kinds of insect-eating plants) and wildlife, including American alligators, rare species of birds such as the peregrine falcon, half a dozen poisonous reptiles, and hundreds of varieties of fish. By the early 2000s, Croatan National Forest incorporated more than 159,000 acres, including 30,000 acres designated by Congress in 1984 as official wilderness areas. 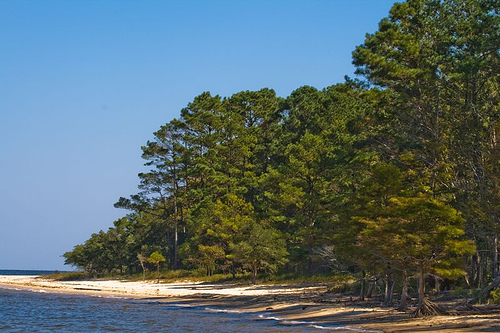 Surrounded by Bogue Sound, the White Oak River, and the Neuse River and its tributary, the Trent, Croatan National Forest, with its unique estuaries and pocosins, continues to remind visitors of the scene many early European settlers must have encountered upon first reaching North Carolina's coast. Marguerite Schumann, The Living Land: An Outdoor Guide to North Carolina (1977). "Forest Meets River, Croatan National Forestm, North Carolina." Image courtesy of LollyKnit. Available from http://www.flickr.com/photos/lollyknit/1586726910/ (accessed November 26, 2012).